Mountbatten is very delighted to announce that Major General Martin White CB CBE JP, Lord-Lieutenant of the Isle of Wight, is to become their Patron. 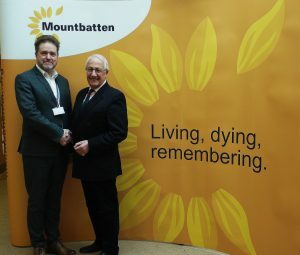 The appointment recognises his growing support of Mountbatten’s work, which on any one day includes the 24/7 care of over 650 Islanders facing death and bereavement in the places that they live across the Island. This is in addition to Mountbatten’s hospice building in Newport, which houses 16 inpatient beds and a range of day services. The charity provides free bereavement support to people of any age, including children and families, regardless of whether the person was being cared for by Mountbatten at the time of their death. Expert teaching to other health and social care organisations forms an important part of Mountbatten’s commitment to improving end of life care for everyone across the Island. Central to Mountbatten is our commitment to developing a society which is much more comfortable and open with death, dying and bereavement. Major General Martin White, said: “I am delighted to become Patron of Mountbatten and to join a team which is recognised as being outstanding in what they do. Nigel Hartley, Mountbatten’s Chief Executive, said: “We are incredibly fortunate that Major General Martin White has agreed to support us, and to help explain how our work impacts the lives of Islanders. It is vital that the Island knows what their generous and tireless fundraising supports. “This year and every year, we must raise over £7 million to ensure free end of life care is available to whoever needs it, wherever they need it. We receive a small amount of financial support from the NHS, but that is not guaranteed. As an independent Isle of Wight charity, neither are we currently supported financially by other national charities including Macmillan or Marie Curie. Our Mountbatten nurses are paid for through the generous donations and fundraising of our Island community. “With Martin’s support, I am sure many more people will start to realise how vital their fundraising is to how we can care for people facing death, dying and bereavement in the future,” he added. The role of Patron is voluntary and extends for a period of five years.